Neil Lennon is hopeful of having a new goalkeeper signed in time for Hibs’ friendly against Shrewsbury Town on Sunday. 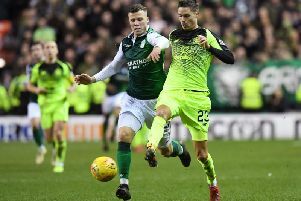 The Easter Road club have been looking to replenish that area of the squad following the departures of Mark Oxley, the No.1 for the last two seasons, and Conrad Logan, who took the gloves for the last month of last term and helped win the Scottish Cup in May. Ross Laidlaw has been recruited from Raith Rovers but, despite an assured display in last week’s victory over Brondby in Denmark, the 24-year-old is unlikely to be considered ready to be Hibs’ No.1 as they bid to win promotion from the Championship at the third time of asking. Otso Virtanen remains on the books, but the 22-year-old Finn has failed to convince thus far. Ideally, Lennon would like to have his new keeper in before Sunday’s friendly against the Shrews at Greenhous Meadow, Hibs’ last match before they begin their Championship campaign away to Falkirk on Saturday week. Alex Palmer, the teenage West Brom goalkeeper who spent some time on trial at Hibs earlier this month and played in the friendly victory over Motherwell, is unlikely to be joining the club.